Hell Valley is located at a valley near the end of Zhongshan Road on the left-hand side next to the New Beitou Park. It has a Japanese name. However, local people call it "the source of sulfur water" or "a ghost lake." The hot spring that flows from the valley is sulphurous and highly erosive. It is the so-called "green sulfur." Its spring water is clear and a little green as a green jade, so that it is also known as "the Jade Spring Valley." 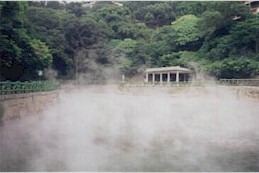 Link: Taipei Travel Net Website "Hell Valley (Thermal Valley) "